Who’s ready to bundle up and sample a whole bunch of beers from craft breweries all over the region? If you pointed both of your thumbs at your chest and said “This guy/gal!” just now, we’ve got some good news for you, buddy. 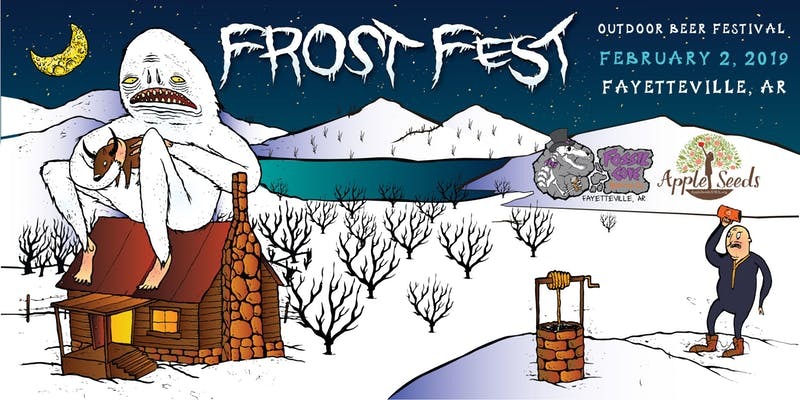 Frost Fest is coming back for a third year this winter. The event, organized by Fayetteville’s Fossil Cove Brewing Co. is set for Feb. 2, 2019 this year at a new location at Lewis Park. Breweries for this year’s event won’t be announced until Dec. 14, but we know that live music this year will be provided by Groovement. In addition to the beer, the event will include food from a host of local food trucks, along with other vendors, artists, makers, and more. The idea behind the event was to get actual representatives from the breweries to show up and pour beer at the festival, and that trend is expected to continue in the event’s third year. General admission tickets go on sale Jan. 7 for $60, and include a sampling glass, plus all the samples you can drink. Early Bird GA tickets will be $50, and are now on sale online. Beer Enthusiast tickets are $70, and include early access to the festival, a larger sampling glass, and a few other perks. A portion of the proceeds from the event will benefit Apple Seeds, Inc. Early bird and Beer Enthusiast tickets are currently on sale at frostfest2019.eventbrite.com. Paper tickets will be available at the tasting room beginning Dec. 15.